Whilst covering the radiation part of the S3 Health Physics unit, we got talking about background radiation. Having given up our radioactive sources this is the only kind of radiation we can now measure, so I left the GM tube hooked up to an ALBA interface for about an hour, beeping away randomly, logging the background. We had a look at the data, recognising the randomness of the readings, but noting that they were all between 7 and 27 counts per minute. It didn't take long to figure out that we should take an average, which we found to be 15 counts per minute. We were discussing the sources of background radiation, especially the geological contributions, when one of the pupils asked if the same experiment done in different places would give different values. I said I was sure it would, especially in areas with lots of granite - e.g. Aberdeen or Cornwall. At this point it occurred to me that I could easily try to find out via the IOP Scottish physics teachers' network (SPUTNIK) and via twitter. 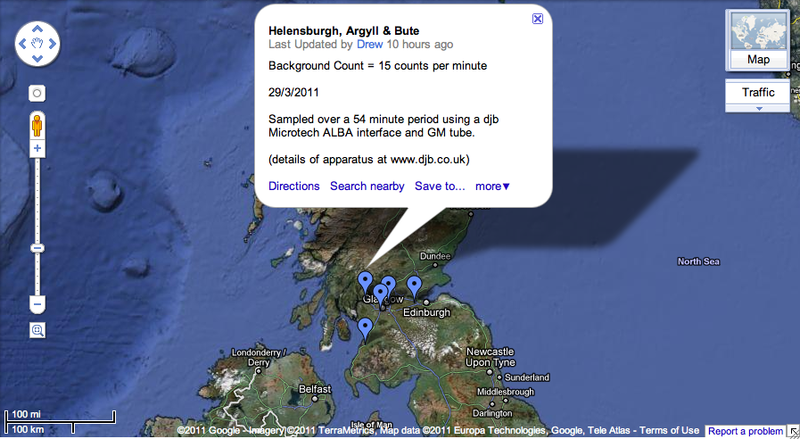 By crowd sourcing data on background radiation we could build up a map of readings on Google Maps. Initially I hoped I might get about half a dozen placemarkers, but after a day or so there were ten, and there were over 1,000 views. At the time of writing there are no more new placemarkers, but there have been over 2,000 views. There have been a few worries about the data, with one contact asserting that this map could 'get us into trouble'. I have no idea what kind of trouble he might be talking about, but felt it necessary to add a disclaimer to the map and ask contributors to add a little detail about their methods of collecting the data they add to the map. The map wasn't intended to become a rigorous study of background radiation levels, only to give a rough idea of geographical variations in the levels in the hope that the Aberdeen and Cornwall levels, if anyone ads them, might be seen to be appreciably higher than other areas. It's also my first attempt at crowd sourcing information and collating it via an online collaborative tool. It's early days, but so far I'm very pleased and confident that some more placemarkers will appear over the next little while.